Debbi Fields (born as Debra Jane Sivyer in Oakland, California, U.S.) is a famous Businessman from USA, she is 62 years old and still alive, born September 18, 1956. Debbi Fields is the founder and current spokesperson of Mrs. Fields Bakeries. Additionally, she has written several cookbooks and makes cookies. Her company motto "Good enough never is", says all about her business philosophy. She worked hard and her customer satisfaction was a priority. That, and the great cookies she baked. 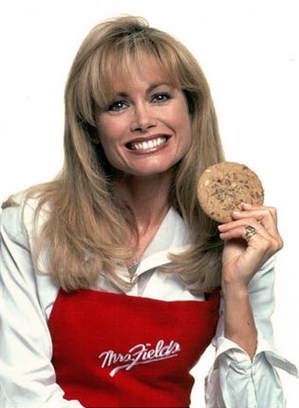 She later changed the company name to Mrs. Fields Cookies to allow for other type of cookies than just chocolate chip. She currently lives in Memphis, Tennessee, with her husband, former Holiday Inn and Harrah's CEO, Michael Rose. She and her husband are very involved in philanthropic work throughout the area. She is born under the zodiac virgo, who is known for Analyzing, Practical, Reflective, Observation, Thoughtful. Our collection contains 6 quotes who is written / told by Debbi, under the main topic Leadership. "Number one, I absolutely love making chocolate chip cookies. I mean, it's fun. It's exciting. Beyond the fact that I love making them, I love eating them"
"You do not have to be superhuman to do what you believe in"
"I use nothing but the best ingredients. My cookies are always baked fresh. I price cookies so that you cannot make them at home for any less. And I still give cookies away"
"I've never felt like I was in the cookie business. I've always been in a feel good feeling business. My job is to sell joy. My job is to sell happiness. My job is to sell an experience"
"If you're going to be at a job environment, you should love it. You shouldn't do it just for money. You should do it because you love it. And the money comes naturally"